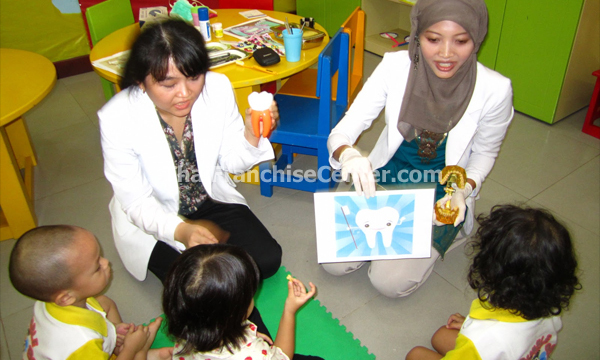 Bumble Bee Preschool offers franchise / waralaba / business opportunity in Indonesia in Early Education Industry, especially in Preschool. Bumble Bee Preschool is committed to providing kids a fun and enjoyable learning environment wherein they can learn by playing about their physical world, their human world and themselves. History Established in 2001, Bumble Bee Preschool saw a need of a preschool that provides a real fun active learning for children under 5 years old in the community. Over the years, it strive to provide a fun, flexible, natural atmosphere of teaching and learning experience that enable children from 18 months old to 5 years old to develop both socially and intellectually based on the philosophy that a child’s works is his play. & Services Programs are now offered for 6 old months, 12 old months, 18 years old, 2 years old, 3 years old, and 4 years old. Each program is based on the developmental needs of preschool children. Infants will be getting appropriate stimulation that foster social, emotional, physical, and cognitive growth. Children become part of a community of learner as they separate from their adult caregivers and learn to master their new environment. Children’s journey continues with ample time to explore an environment enriched with literacy, math, art, music and movement. Thoughtfully constructed environments promote critical thinking skills and prepare children for entry into Kindergarten.